The DCA-10 is ready to use right out of the box. An anodized aluminum heat sink and enclosure may be used as a stand-alone base, or integrated into existing hardware. The DCA-10 also provides a convenient +5V regulated output to power encoders, limit switches, or other electronic components. The DCA-10 is a four quadrant variable speed drive designed for DC brushed motors. 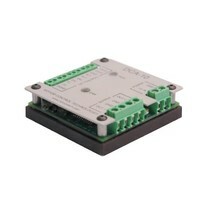 The DCA-10 is capable of sourcing up to five amps continuous current at +24VDC. A simplified control scheme uses one PWM signal and one digital line to drive the speed and direction of a motor. 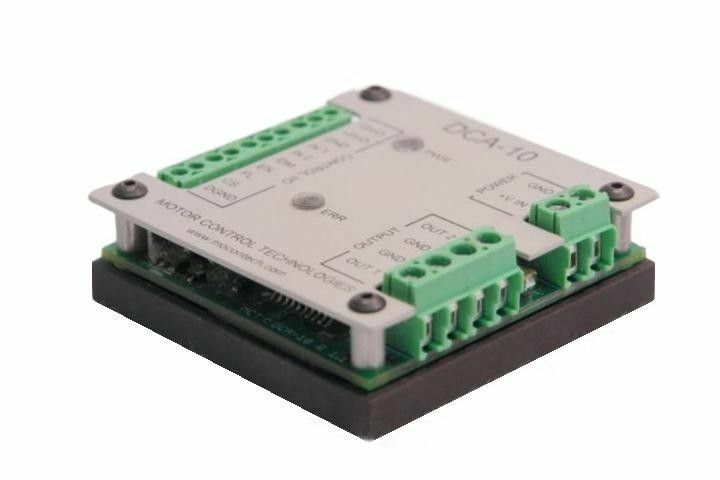 The DCA-10 is fully compatible with +3.3V and +5V logic levels, making it easy to integrate with standard data acquisition hardware and microcontroller technologies. Additional feedback and control options enhance the DCA-10 control capabilities. An analog voltage signal provides real-time load current monitoring. Other available features include short circuit detection, over temperature shutdown, +5V supply output, and drive enable/disable capabilities. The DCA-10 also has an expanded operating mode to control up to two inductive or resistive loads. This feature allows the user to control power to loads such as solenoids, small DC heaters, or individual phases on a stepper motor. The DCA-10 is ready to use right out of the box. An anodized aluminum heat sink and enclosure may be used as a stand-alone base, or integrated into existing hardware. The DCA-10 also provides a convenient +5V regulated output to power encoders, limit switches, or other electronic components.